Mystery on Mars: Does Methane Really Indicate Life? SAN FRANCISCO — Scientists may never know for sure if NASA's Curiosity rover detected signs of life on Mars two years ago, but now is the right time for them to gather some promising clues. Last December, the Curiosity team announced that methane concentrations in the air around the rover, which has been exploring Mars' 96-mile-wide (154 kilometers) Gale Crater since August 2012, jumped by a factor of 10 for about two months from late 2013 through early 2014. 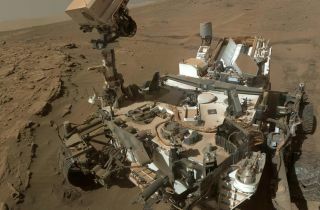 Although methane had been discovered before from space, Curiosity made the first in-situ discovery of rapid changes in methane concentration from the surface of Mars. See how Curiosity found methane on Mars in our full infographic. But Red Planet microbes aren't the only possible explanation; geological processes can produce methane as well. Indeed, a new study lays out three scenarios that could explain the mysterious spike, and only one of them invokes the presence of Mars life. One hypothesis that doesn't involve life holds that methane commonly gloms onto Martian soil particles in dry conditions and then is released into the air when salts known as perchlorates "deliquesce" (become liquid after absorbing atmospheric water), said lead study author Renyu Hu, who's based at the California Institute of Technology and NASA's Jet Propulsion Laboratory (JPL), both of which are located in Pasadena. The other nonlife idea posits that Curiosity encountered a random, localized outburst of methane that had previously been locked in a subsurface aquifer, Hu said. All of the envisioned possibilities — perchlorate deliquescence (Hypothesis 1), life (Hypothesis 2) and random outburst (Hypothesis 3) — can be tested, to some extent, using future Curiosity observations, Hu told Space.com Wednesday (Dec. 16) here at the annual fall meeting of the American Geophysical Union (AGU), where he presented the research. For example, Hypotheses 1 and 2 predict that methane spikes should occur at about the same time each Martian year, since both explanations tie the gas surges to the deliquescence cycle. (In the case of life, previously dormant organisms would be "activated" by the presence of briny liquid water, Hu said.) The scenario involved in Hypothesis 3 should not be as strongly seasonal. Hypotheses 1 and 2 even make slightly different predictions about the timing of methane release. "Hypothesis 2 predicts a spike a little bit later in the winter," Hu said. The hypothesis testing is, in fact, underway, and there's already some bad news (for people who favor the Mars microbes explanation, at least): Curiosity has seen no signs yet of another methane surge despite regular and repeated sampling efforts, said JPL's Chris Webster, the lead author of the December 2014 study announcing the 2013-2014 spike. This diagram shows possible ways by which methane might incorporate into Mars' atmosphere (sources) and disappear from the atmosphere (sinks). The most recent analyzed measurements were taken two weeks ago — the rough equivalent, season-wise, of the halfway point of the 2013-2014 spike, said Webster, who presented these new results Thursday afternoon (Dec. 17) here at AGU. "I'd say it's unlikely to come back," Webster told Space.com.